Specially designed for families, 75 m² Superior Family room at Novotel Samui Resort Chaweng Beach Kandaburi is located at the hillside of the hotel with beautiful garden or sea views from a private balcony. 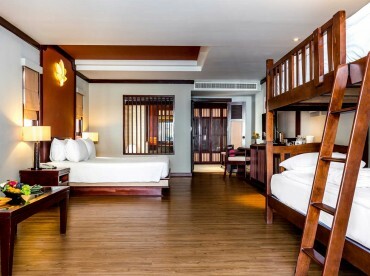 The room offers a comfortable double bed and bunk beds for 2 kids. To make you feel home away from home the room features LCD TV, minibar, tea/coffee making facilities and complimentary WiFi. Large en suite bathroom includes a bathtub, shower, free toiletries and a hairdryer.